Expedition to Mid-Cayman Rise Identifies Unusual Variety of Deep Sea Vents: Method included first use of nereus hybrid vehicle in “autonomous” mode. Home > Expedition to Mid-Cayman Rise Identifies Unusual Variety of Deep Sea Vents: Method included first use of nereus hybrid vehicle in “autonomous” mode. The first expedition to search for deep-sea hydrothermal vents along the Mid-Cayman Rise has turned up three distinct types of hydrothermal venting, reports an interdisciplinary team led by Woods Hole Oceanographic Institution (WHOI) in this week’s Proceedings of the National Academy of Sciences. The first expedition to search for deep-sea hydrothermal vents along the Mid-Cayman Rise has turned up three distinct types of hydrothermal venting, reports an interdisciplinary team led by Woods Hole Oceanographic Institution (WHOI) in this week’s Proceedings of the National Academy of Sciences. The work was conducted as part of a NASA-funded effort to search extreme environments for geologic, biologic, and chemical clues to the origins and evolution of life. Hydrothermal activity occurs on spreading centers all around the world. However, the diversity of the newly discovered vent types, their geologic settings and their relative geographic isolation make the Mid-Cayman Rise a unique environment in the world’s ocean. The Mid-Cayman Rise (MCR) is an ultraslow spreading ridge located in the Cayman Trough – the deepest point in the Caribbean Sea and a part of the tectonic boundary between the North American Plate and the Caribbean Plate. At the boundary where the plates are being pulled apart, new material wells up from Earth’s interior to form new crust on the seafloor. The team identified the deepest known hydrothermal vent site and two additional distinct types of vents, one of which is believed to be a shallow, low temperature vent of a kind that has been reported only once previously - at the “Lost City” site in the mid-Atlantic ocean. “Being the deepest, these hydrothermal vents support communities of organisms that are the furthest from the ocean surface and sources of energy like sunlight,” said co-author Max Coleman of NASA’s Jet Propulsion Laboratory, Pasadena, Calif. “Most life on Earth is sustained by food chains that begin with sunlight as their energy source. While vent sites occupy small areas on the sea floor, the plumes formed when hot acidic vent fluids mix with cold deep-ocean seawater can rise hundreds of meters until they reach neutral buoyancy. Because these plumes contain dissolved chemicals, particulate minerals and microbes, they can then be detected for kilometers or more away from their source as they disperse horizontally in the ocean. The chemical signatures of these plumes vary according to the type of vent site from which they originated. The three known types of vent sites are distinguished by the kinds of rock that host the sites. The first type of vents occur throughout the world’s mid-ocean ridges and are hosted by rocks that are rich in magnesium and iron --called mafic rocks. The second and third types of vent sites are hosted in rocks called ultramafic that form deep below the seafloor and are composed of material similar to the much hotter lavas that erupted on Earth’s very earliest seafloor, thousands of millions of years ago. The discovery of ultramafic-hosted vent sites such as those on the Mid-Cayman Rise could provide insight into the very earliest life on our planet and the potential for similar life to become established elsewhere,” said German. For this mission, German and his colleagues used the plumes in the search for hydrothermal vents, employing sensors mounted on equipment and robotic vehicles to track the chemicals back to their source. 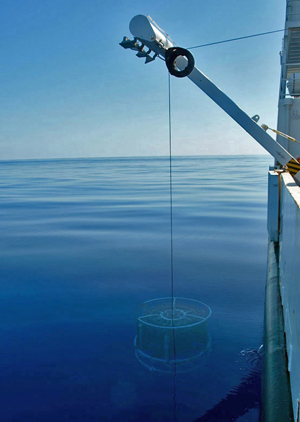 This expedition used a CTD (conductivity, temperature, and depth) array augmented with sensors to detect suspended particles and anomalous chemical compositions (the latter sensor courtesy of Ko-ichi Nakamura from AIST in Tsukuba, Japan) mounted on both a water sampling rosette and the hybrid vehicle Nereus, a deep-diving robot that can operate in both in tethered and free-swimming modes. Using the CTDs and Nereus in “autonomous” or free-swimming mode, the team sniffed out deep-sea plumes originating from the seafloor hydrothermal vents. Using a combination of shipboard and shore-based analyses of water samples for both their chemical and microbial contents, the team was then able to track the plumes toward their sources as well as to determine the likely nature of the venting present at each site. The ultimate goal was to switch Nereus into tethered or “remotely operated” (ROV) mode during the latter stages of the cruise and dive on each vent site to collect samples using Nereus’ robotic manipulator arm. The first two sites the team identified are extremely deep and were named Piccard and Walsh in honor of the only two humans to dive to the Challenger Deep – the deepest part of the world’s ocean. The plume detected at the Piccard site, 800 meters deeper than the previously known deepest vent, was comparable to plumes from the “Type 1” vent sites, first found in the Pacific Ocean in 1977. “We were particularly excited to find compelling evidence for high-temperature venting at almost 5000m depth. We have absolutely zero microbial data from high-temperature vents at this depth,” said Julie Huber, a scientist in the Josephine Bay Paul Center at the Marine Biological Laboratory (MBL) in Woods Hole. Huber and MBL postdoctoral scientist Julie Smith participated in this cruise to collect samples, and all of the microbiology work for this paper was carried out in Huber's laboratory. The Walsh plume also exhibited signals characteristic of a high temperature site, but with a chemical composition (notably the high methane-to-manganese ratio) typically found at a high temperature, ultramafic hosted “Type 2” vent site. The third site – which the team have named Europa, after the moon of Jupiter, most closely resembles the “Lost City” vent site in the mid-Atlantic ocean — to date the only confirmed low-temperature “Type 3” site. 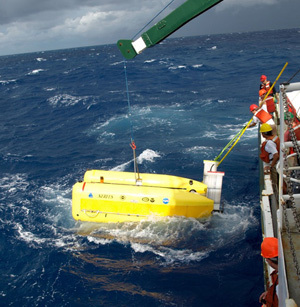 Half way through the six-day leg in which Nereus was converted into ROV mode, tropical storm Ida intervened and stopped the team from viewing or sampling the vent site. Though they had come within less than 250 meters of the vents at the seafloor, they had to ride out the storm for the last three days of the cruise and return to port frustrated. However, all was not lost. The research team shared their findings with an international team led by Jon Copley of the National Oceanography Centre in Southampton, UK, who returned to the MCR in Spring 2010 and imaged active vents at both the Piccard and Europa locations using a deep-towed camera called Hybis. By exploring this extreme and previously uninvestigated section of the Earth’s deep seafloor, the researchers seek to extend our understanding of the limits to which life can exist on Earth and to help prepare for future efforts to explore for life on other planets. This news is from the Woods Hole Oceanographic Institution,20 July, 2010. The Woods Hole Oceanographic Institution is a private, independent organization in Falmouth, Massachusetts., dedicated to marine research, engineering, and higher education. Established in 1930 on a recommendation from the National Academy of Sciences, its primary mission is to understand the ocean and its interaction with the Earth as a whole, and to communicate a basic understanding of the ocean's role in the changing global environment.